When we become a mom our mama bear just comes out. Celebrate a new mom with this whimsical keychain. 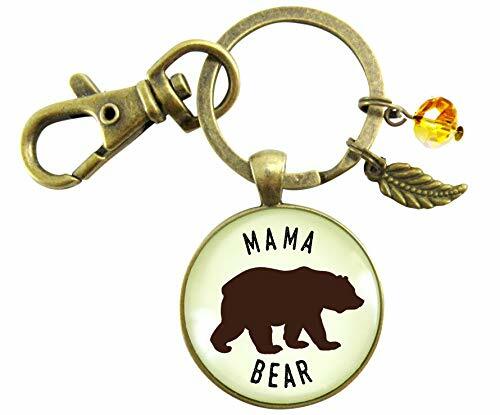 Keychains available for Papa Bear too in another listing. This glass pendant necklace includes a zinc alloy bronze-colored leaf charm and an amber-brown-colored glass bead. It's a fun piece of motherhood jewelry designed by Gutsy Goodness. The glass pendant keychain is 1.20" (30mm), larger than many pendants you find that are just 25mm. The metal pieces are zinc alloy with an antique bronze finish. This listing is for a keychain chain. "A mama may look loving and gentle, but never doubt that she can also be fierce when necessary! Let us celebrate the mama bear who shows herself when her children need defended, advocated for, loved, or protected. There is no greater love than that which a mama bear reveals." If you have any questions about this product by Gutsy Goodness, contact us by completing and submitting the form below. If you are looking for a specif part number, please include it with your message.